Vientiane (VNA) – The official friendly visit to Laos from February 24-25 by Vietnamese Party General Secretary and President Nguyen Phu Trong is expected to contribute to tightening, enhancing and developing the traditional friendship, special solidarity and comprehensive cooperation between the two countries, a Lao official has said. In a recent interview granted to the Vietnam News Agency (VNA), Lao Minister of Planning and Investment Souphan Keomixay, who is also Chairman of the Laos-Vietnam Cooperation Committee, affirmed that the upcoming visit is of special significance to the Lao side. It will create a foundation for the two countries to effectively optimise their potential for investment cooperation in the new situation, the official said, noting that during the visit, the two sides will sign many documents crucial to the bilateral relationship. He emphasised the need for both Vietnam and Laos to further deepen the traditional and pure relations, create breakthroughs and bring about the highest interests to their people. Souphan Keomixay commended the cooperation in politics, diplomacy, national defence and security between the two countries in the past year which has facilitated the national construction and development of each side. He also highlighted the bilateral collaboration in energy, education and human resources development as well as partnership between Vietnamese and Lao ministries, agencies and localities. 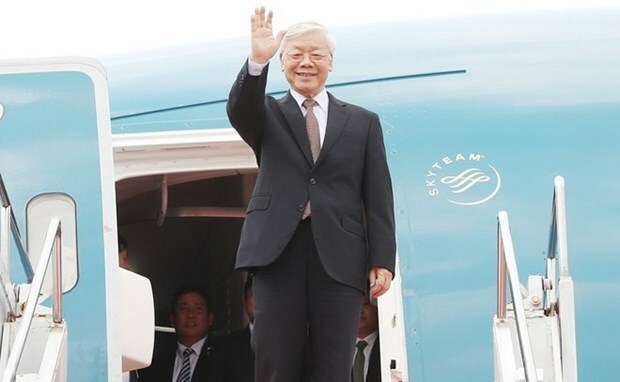 In the coming years, the two sides should continue to implement agreements reached by high-ranking leaders of the two Parties and States, especially the one on cooperation strategy in economy, culture, education, and science-technology between Vietnam and Laos in the 2011-2020 period, as well as the one on Vietnam-Laos cooperation strategy by 2020 in Huaphan and Xiengkhoang provinces, he said. The official also called for joint efforts in realising the bilateral collaboration agreement for the 2016-2020 period and another on cooperation plan between the two governments in 2019. Breakthroughs are needed to promote the special ties, he said, suggesting that Vung Ang Seaports 1,2 and 3 should be further developed to help Laos handle its exports and imports. Vietnam’s purchase of Lao electricity will help generate jobs and income for the two peoples in future, he said. Souphan Keomixay urged businesses of the two countries to harmonise their benefits with interests of Vietnamese and Lao peoples, especially those living in project areas, and respect custom and culture in the host countries.